Prefer to order over the phone? Call Us Toll Free: (866) 902-8594(866) 902-8594. FREE Shipping on Orders over $75. All prices shown in Canadian Dollars. Click "Place Your Order" below to check out using PayPal. A 1 oz spray bottle that evenly distributes relief with a unique blend of seven essential oils. 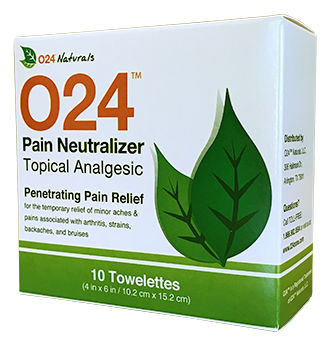 O24™ Pain Neutralizer is derived from the active ingredient Camphor (3.1%) and is combined with inactive ingredients Aloe Vera oil, Eucalyptus oil, Lemon oil, Orange oil, Peppermint oil and Rosemary oil. Use Directions: Adults apply to affected area not more than 3 to 4 times daily. Keep out of reach of small children. Stop and consult a physciaian if condition worsens, or if symptoms persist for more than 7 days or clear up and occur again within a few days. Warnings: External use only. Not to be taken orally. The application of external heat, such as an electric heating pad, may result in excessive irritation or skin burn. Avoid contact with eyes and mucous membranes. Do not bandage tightly. Do not apply to wounds, damaged, broken or irritated skin. Do not use if you are pregnant or breastfeeding. Have more questions or need additional information? Contact Us, or check out our Questions and Answers section.